Select Your Height 4' 0" 4' 1" 4' 2" 4' 3" 4' 4" 4' 5" 4' 6" 4' 7" 4' 8" 4' 9" 4' 10" 4' 11" 5' 0" 5' 1" 5' 2" 5' 3" 5' 4" 5' 5" 5' 6" 5' 7" 5' 8" 5' 9" 5' 10" 5' 11" 6' 0" 6' 1" 6' 2" 6' 3" 6' 4" 6' 5"
Green color tiered ankle length faux georgette anarkali suit. Kameez made with embroidered, hemline work, patch work, patch border work. This kameez comes with matching dupatta and bottom. The unstitched kameez bust size can be customized from 34 to 42 inches. Kurta length can be made maximum 42 inches and chest can be made upto 46 inches. 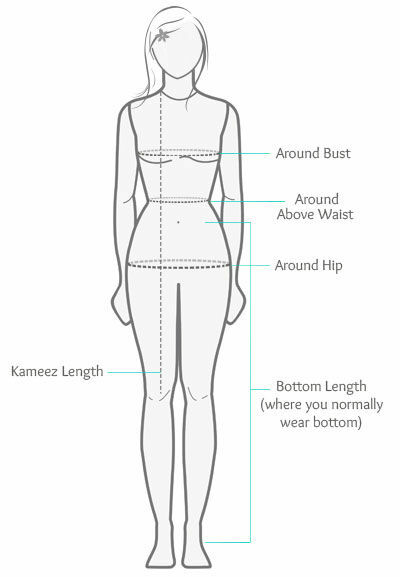 Kurta length will be customized as per your given size and length. If you need unstitched fabric for your desired outfit then we can provide to you in such case you need not to pay stitching charges. Processing time depends on product to product and mentioned with every item however stitching process will be of 2 to 3 days. I got my saree ,its really beautiful , I looks gorgeous after wearing it.